Your inner history buff will appreciate Savannah Historic District and Bonaventure Cemetery. Your cultural itinerary includes sights like Cathedral of St. John the Baptist and Colonial Park Cemetery. 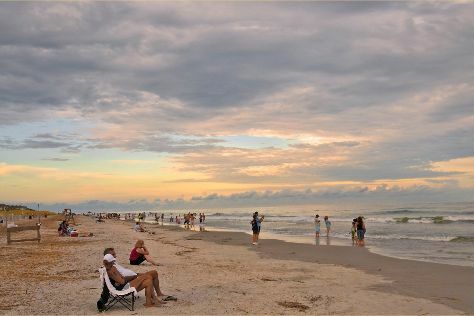 Explore the numerous day-trip ideas around Savannah: Tybee Island Beach (in Tybee Island) and Hilton Head (Waterskiing & Jetskiing, Speed Boats Tours, & more). There's much more to do: go on a hair-raising tour with a ghost and vampire tour, tour the pleasant surroundings at Forsyth Park, brush up on your military savvy at Old Fort Jackson, and admire the landmark architecture of Mickve Israel Temple. For ratings, photos, maps, and tourist information, go to the Savannah online driving holiday planner . If you are flying in from Australia, the closest major airports are Savannah Hilton Head International Airport, Charleston Air Force Base-International Airport and Augusta Regional At Bush Field. Expect a daytime high around 34°C in September, and nighttime lows around 24°C. Finish your sightseeing early on the 24th (Tue) so you can travel back home.